The Mobil SuperTM “Go the Distance” Baseball Tour is going coast-to-coast for four months – stopping in 31 baseball cities. Baseball legends are back as Mobil Super brand ambassadors during “star stops” throughout the 2016 tour. Fans can meet brand mascot Mobil Super Sam and win special prizes at each stop. "The tour has become an annual tradition, visiting great baseball cities, interacting with our valued customers and bringing baseball legends to town." HOUSTON--(BUSINESS WIRE)--With the return of summer, the sixth annual Mobil SuperTM “Go the Distance” Baseball Tour is hitting the road. The 2016 edition is visiting 31 classic baseball cities and bringing the legendary, 40-foot Mobil Super RV and brand mascot Mobil Super Sam along for the ride, connecting with customers coast-to-coast via the common bond of America’s pastime. 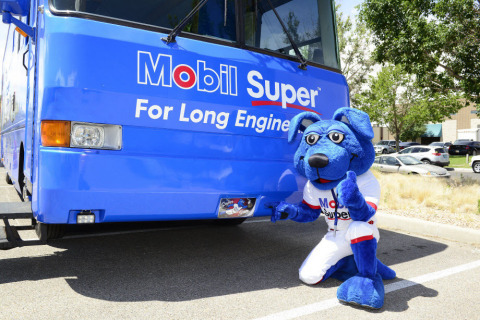 Each stop of the tour begins at a local Mobil Super retail or quick lube partner location before heading to the ballpark to greet fans. Special prizes and promotions are available for fans in attendance, including the chance to throw the evening’s ceremonial first pitch or to join Mobil Super Sam on the field between innings for exciting games, contests or giveaways. The tour kicked-off in Tulsa, Okla. for an early season Tulsa Drillers game before sliding into San Antonio, Texas to visit the San Antonio Missions. In June, the Mobil Super Tour makes its way to the West Coast, stopping in Eugene, Ore. to join the Eugene Emeralds. The tour then heads to the Midwest, visiting Sioux City, Iowa to catch the Sioux City Explorers and also stopping in Peoria, Ill. for a Peoria Chiefs sighting. The tour’s East Coast swing comes in August, with stops in Scranton, Pa. to join the Scranton RailRiders and Pawtucket, R.I. to see the Pawtucket Pawsocks. The Tour concludes in Norfolk, Va. with a visit to the Norfolk Tides. Ryan Klesko hit at least 21 home runs in eight of his 13 major league seasons, with a high of 34 homers in 1996. Klesko became the first player to hit a home run in three consecutive World Series road games. Bill Buckner accumulated more than 2,700 hits in his twenty-year career, won one batting title and was named an All-Star in 1981. He is one of a few players who had 200 hit-seasons in both leagues and played in four decades. 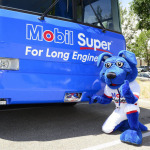 For a full list of Mobil Super Baseball Tour stops and this year’s major leaguers, be sure to visit MobilOil.com. Additional details on the “star stops” will be announced as dates near. Timing for each “super stop” is tentative. Mobil Super: A premium conventional motor oil that helps extend engine life, Mobil Super is guaranteed to deliver proven protection for up to 5,000 miles between oil changes and features extra cleaning additives. It is available in 5W-20, 5W-30, 10W-30 and 10W-40 viscosities. Mobil Super™ High Mileage: Uniquely formulated to help extend engine life in vehicles with more than 75,000 miles, this motor oil contains seal conditioners to help prevent engine leaks and reduce oil consumption. It is available in 5W-20, 5W-30, 10W-30 and 10W-40 viscosities. Mobil Super™ Synthetic: A full synthetic motor oil designed to help extend engine life, Mobil Super Synthetic oils provide improved engine protection in a wide variety of weather, temperatures, and driving conditions for vehicles of all ages. It outperforms our conventional and synthetic blend ending oils and is available in 0W-20, 5W-20, 5W-30 and 10W-30 viscosities.